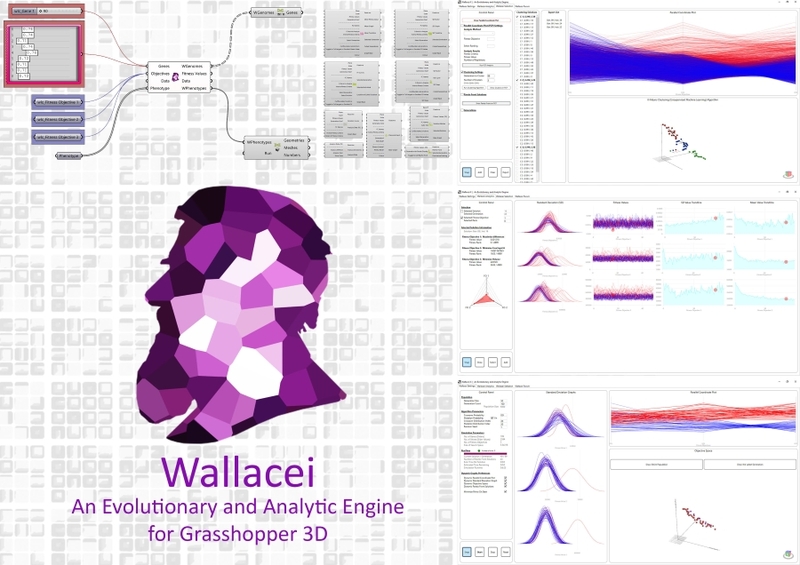 Wallacei, a new plug-in for Grasshopper, is an evolutionary engine to run simulations through using highly detailed analytic tools coupled with various comprehensive selection methods, including algorithmic clustering, to assist users to understand their evolutionary runs better and make more informed decisions at all stages of their evolutionary simulations. This includes setting up the design problem, running the evolutionary algorithm, analyzing the results and selecting the desired solutions for the final output. Wallacei also provides users with the ability to select, reconstruct and output any phenotype from the population after completing their simulation. Wallacei also has a full tutorial series on how to use the plug-in and an official Wallacei primer that goes through all the features and functions of the plug-in. Download the tutorials and the Primer through the Wallacei website.